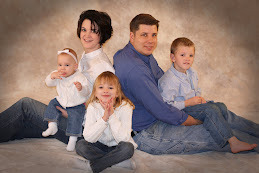 We sure had fun this year with Papa Jim and Nana, Katie, Dave and the girls and our family. 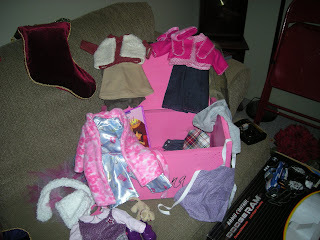 Santa left Anna clothes and box to dress and store her 18" doll from Grandma. Santa spent many hours making all kinds of outfits. Ethan got a remote controlled car. 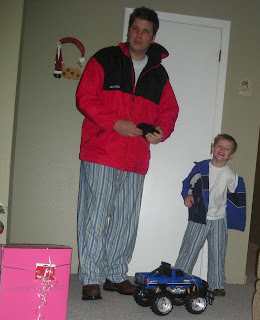 At 6:10 Christmas morning Eric and Ethan are in the pajamas, coats and hats outside in the dark. We could hear Ethan squealing with excitment. Then we heard Eric... it's my turn. Santa's goal with Sarah is just make her stuff she could put in her mouth. He did a Great JOB! We had such a great time with all of you. Thank you for opening your home to us and allowing us all the laughs. 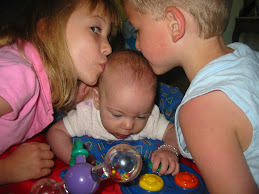 We love you very much. We had such a wonderful Christmas. Thank you guys SO much for coming down. It looks like you had a lot of fun. The clothes look great and I love the truck. That's funny that Eric had to have his turn. Your posts are fun to look at and see the pictures. You have such talent with crafty things! 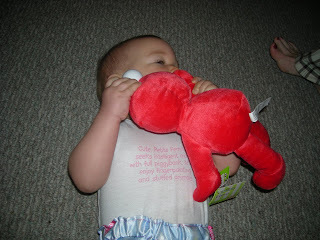 Those doll clothes are fun. From famine to feast, it's fun to see you blogging again! Gald you had a great Christmas! Wow, you made all those doll clothes, they look great.